Abruzzo is an area in the central Italy and it is a very favourite destination for spending pleasant holidays at a seaside and in the inland, too. The region is mainly known for its natural parks and therefore great for nature and tourism lovers. The coastline is very attractive and holidays at the seaside are very popular there. There are shallow and gold beaches which guarantee fun at the sea for the whole family. 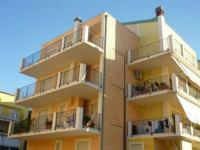 We can recommend an apartment by the sea in Italy in a known destination Pineto. It offers a large pool which will refresh you for the whole day. The cuisine of that region is simple, but delicious. Residential complex MED RESORT *** is situated only 100m from the famous beach resort of Pineta (500m) in the region of Abruzzo. It is a quiet and picturesque resort with sandy promenade beside the sea. Residence features a private pool and is ideal for family holidays with children. The apartments are conveniently and nicely equipped with en suite bathroom, terrace, balcony, outdoor seating on the ground floor. Sport and Entertainment: cycling or rollerblading, beach volleyball, soccer, windsurfing. In the center of a rich social life (approx. 700 m) - cafes, retaurace, pizzerias, discos, cinema, theater. This three-storey residence is located directly on the beach (30 meters), about 600 m from the center Cologna Spiaggia, 6 km from Giulianova and 2 km from the resort of Roseto degli Abruzzi. Both cities can also be reached bicycle path, you will find supermarkets, restaurants, post office, pharmacy. In early 2014, has undergone complex reconstruction and a secondary hotel was built a new two-storey residence with apartments. The entire complex now consists of two buildings. The complex also includes a renowned restaurant where it is possible to provide catering for groups and individuals. Clients have access to a swimming pool, communal gardens with beach umbrellas and chairs, restaurant, bar, indoor parking (limited spaces), near the football field and tennis courts (for a fee). The sandy beach is free or paid with beach service, ideal for small children. Here we Trilo apartment for up to 6 people with 2 bedrooms, living room with kitchenette, bathroom, TV, air conditioning (fee), furnished terrace or balcony. You can also rent an apartment for 2 + 2 persons - IT-924. The place is a Slovak-speaking assistant. Here we offer apartment Bilo 4 for 2 + 2 persons with 1 bedroom, living room with sofa bed and kitchenette, bathroom, TV, air conditioning (fee), furnished terrace or balcony. You can also rent an apartment for 4 + 2 persons - IT-923. There is a Slovak-speaking assistant. This new residence with elevator is located in the first row of houses by the sea, just a few steps from the sandy beach with gradual entry into the sea in Tortoreto Lido. Nearby you will find many shops, restaurants, pizzeria and gelateria. Here we offer elegantly furnished apartment Trilo 5 B for 5 people. The apartment is located on the 4th floor of the residence overlooking the green. By amenities include a washing machine, TV, air conditioning (on request, for a fee), some apartments also have a dishwasher. Clients are available parking space within the complex (on request, for a fee). Pets are allowed - smaller races (on request, for a fee). 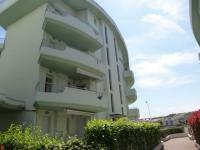 This new residence with swimming pool is located just 100 m from the sea, near the promenade in Tortoreto Lido. Not far from the residence there is a sports center with football, volleyball fields and other sports facilities. Here we offer apartment Trilo 6 for 6 people. The apartment has a washing machine, TV and balcony. Some apartments have sea views, some of the pool. Clients garage is available (for a fee). Under code IT-932 can be ordered duplex apartment Duplex 8 for 8 people. Here we offer a duplex apartment Duplex 8 for 8 people. The apartment has a washing machine, a TV and a furnished balcony. Some apartments have sea views, some to the pool. Garage is available for a fee. Under code IT-931 can be ordered Apartment Trilo 6 for 6 people.